Men today are at a critical juncture—resist change and cling to the old model of manhood, or embrace a call to wake up from the coma of toxic manly behaviors, grow into healthier adulthood, and show up to serve the world. 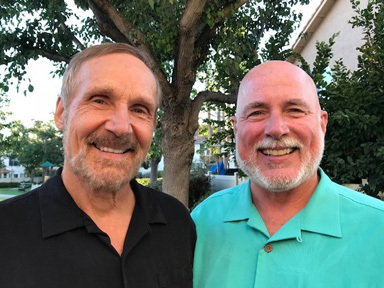 Leonard and Rick have been actively involved in developing programs for men’s personal growth and healing for decades. Together they’ve explored masculinity with thousands of men and facilitated workshops in eleven countries on five continents. They will share their experiences, personal stories, and a paradigm that synthesizes cutting edge work about masculinity from the fields of positive psychology, sociology, and personal development. Leonard Szymczak, MSW, LCSW is an award-winning author, speaker, psychotherapist, and life coach, who has been on the vanguard of men’s healing for 35 years. His books include: The Roadmap Home: Your GPS to Inner Peace,an Amazon bestseller, as well as two lighthearted satires on psychotherapy. He co-authored with Mari Frank, Fighting for Love: Turn Conflict into Intimacy. He maintains a counseling and coaching practice in Orange County. Rick Broniec, M.Ed. is a writer, inspirational speaker, and coach. He has been a pre-eminent leader of men’s international trainings with ManKind Project since 1990. He is an Amazon bestseller author of The Seven Generations Story: An Incentive to Heal Yourself, Your Family and the Planet (2015) andA Passionate Life: 7 Steps for Reclaiming Your Passion, Purpose and Joy (2011).